The British Chamber of Commerce’s economic survey for the final quarter of 2018 highlights the challenges that the UK manufacturing sector is experiencing in recruiting qualified staff, a situation that is having a direct effect on salaries. The survey reported that four-fifths (81%) of manufacturers that tried to recruit reported difficulties in finding the right staff – equalling the highest level since the survey began in 1989. 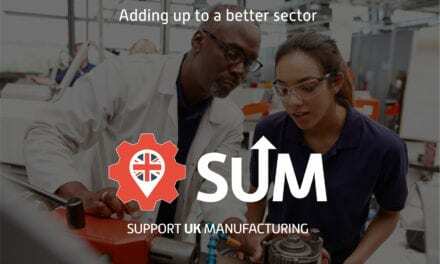 Graeme Wright, CTO for manufacturing, utilities, and services at Fujitsu UK explains that while the sector has noted a pick-up in output in recent months, it’s a significant concern that British manufacturers are facing a shortage of skilled workers; an issue that needs to be addressed by the industry. “In an era where digital technologies are undeniably disrupting the sector, manufacturers need to ensure their organisations are built in a way that allows them to continually embrace innovation and drive productivity gains to get efficiencies,” he says. “Labour has long been a critical factor of production; however, more and more, we are seeing data as the lifeblood of the organisation to drive better decisions, and the new possibilities technologies such as artificial intelligence, the Internet of Things and wearables can offer with breakthroughs in efficiencies which close the gap in supply and demand for a skilled workforce. “In the long run, the need for skilled workers, with additional skills in analytics, AI and optimisation, cannot continue to go unaddressed. 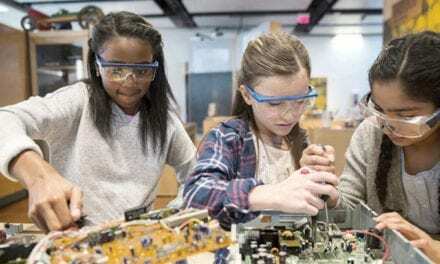 Educators need to work with industry partners who can help bring more advanced technology into the classroom, provide advice and examples of the skills employers are looking for and adapt the syllabus accordingly. Most importantly, they need to provide opportunities for students to gain real-world experience and ensure that the sector has a long-term pipeline of talent to help drive its future. The fact that the UK manufacturing sector is facing its biggest worker shortage in 30 years serves as a stark reminder of the challenges manufacturers are facing as a result of Brexit. “The current skills shortage simply cannot be ignored, tougher immigration rules and a drop in the pound has meant that working in the UK will become less attractive and accessible for foreign nationals to work here,” Mark Hughes, regional vice president UK and Ireland, at Epicor explains. “Consequently, manufacturers are now recruiting from a reduced talent pool and need to think cleverly about how they operate if they are to attract new generations of talent into the industry. 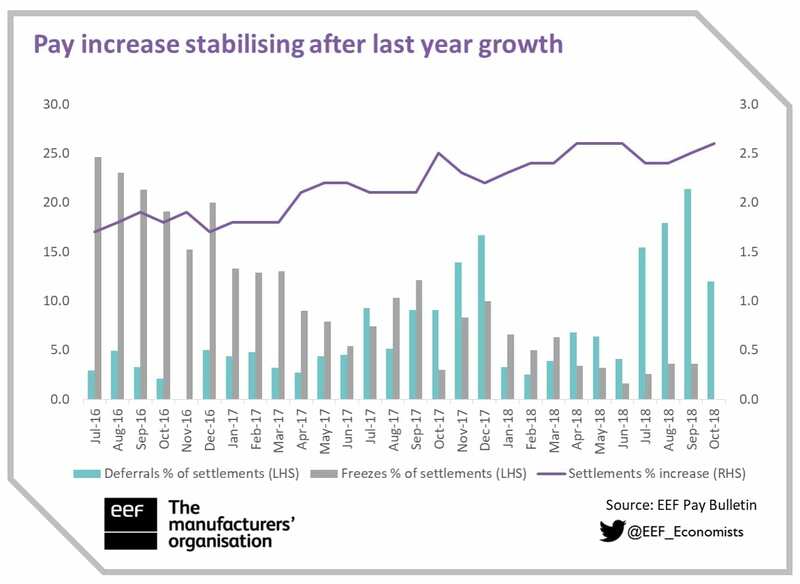 The latest EEF Pay Bulletin released late in 2018 showed a 2.6% increase for manufacturing wages in the three months to October, up from 2.5% the previous month. Overall, the figure has been stable in the last six months after the 2017 pick-up. Manufacturing wages accelerated sharply in the second half of 2017, on the back of a very good manufacturing output performance. However, after peaking between the end of 2017 and beginning of 2018, pay has started to slow down, whereas whole economy wages continued to grow steadily. Sectors such as construction, distribution and accommodation are seeing big rises but public wages also received a long-waited increase in June. “It is clear that shopfloor workers received a higher pay rise in the last two years. This might be related to the national living wage, which increased pressure on lower paid jobs, but also the scarcity of technical skills available on the markets – something that is continuously reported by manufacturers and clearly visible in the vacancies statistics,” Arcangeli concludes. 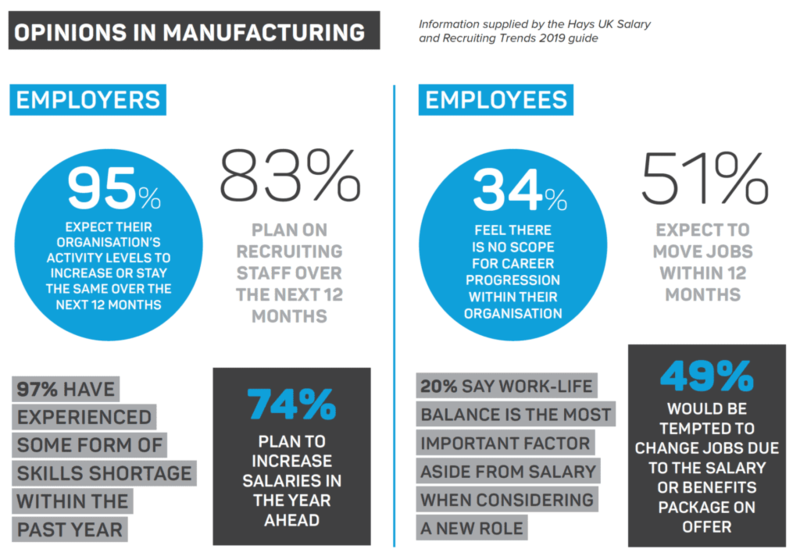 According to the Hays UK Salary and Recruiting Trends 2019 guide, 64% of engineering and manufacturing employers expect their organisation’s activity levels to increase in the next 12 months, an increase from 57% last year. This level of optimism is clear in recruiting plans, as 83% of engineering and manufacturing employers plan on recruiting staff this year, a 9% rise from the previous year. 70% of manufacturing employers expect to recruit permanent staff over the next 12 months, compared to 59% last year. In addition, 72% of engineering employers are also planning to hire permanent staff. Employers are still turning to temporary staff to fill skills gaps and provide much-needed flexibility in the context of market uncertainty, and both engineering (30%) and manufacturing (35%) employers expect to hire temporary, contract or interim staff in the next 12 months. Competition for skills caused most engineering and manufacturing employers (72%) to increase salaries last year, in line with the UK average of 73%. Salary satisfaction has also increased, with only 38% of employees saying they are dissatisfied, in comparison to over half (54%) last year. 74% of employers are planning to increase salaries again in the year ahead. “This will only increase what is already a hugely competitive market for talent and put further pressure on employees to increase pay in order to attract and retain staff,” Simon Winfield, managing director, Hays UK & Ireland, says. “Employers will need to act decisively if they are to keep ahead of the competition, particularly when recruiting in highly competitive areas such as technology, by making strong offers not only around salary but also on work-life balance, career progression, and the other aspects important to employees. Technology roles have secured the top salary rises in the last twelve months according to new data released by Hays. In a list of the top ten roles which received the highest salary increases, eight of these were technology roles. Data architects saw an average increase of 6.2%, whilst database developers saw a higher than average rise of 5.6%. “The challenge for employers is escalated by organisations having to adapt ever more quickly to the world around them,” Winfield says. “With political, economic, social and technological change taking place more rapidly than ever, employers are under pressure to move fast to capitalise on new opportunities. Of course, to do this they need ready access to a skilled workforce. “For many businesses this change means increased digitalisation, automation and investment in technology, resulting in extremely fierce competition from all sectors for the already stretched talent pool of digital skills.” As we await the outcome of the Brexit negotiations there is continued uncertainty around the impact that this will have on the market and what this could mean for UK businesses. Whiles times are good now, the future salary prospects for the manufacturing sector remain dependent on a range of outside influences, including the outcome of Brexit, the ability to attract graduates into the sector to fill the digital roles required and, of course, the overall health of the sector itself. There will always be a place for manual shopfloor workers but the real winners in the sector will be those that can incorporate the new digital trends such as data analytics, machine learning, edge computing and blockchain.